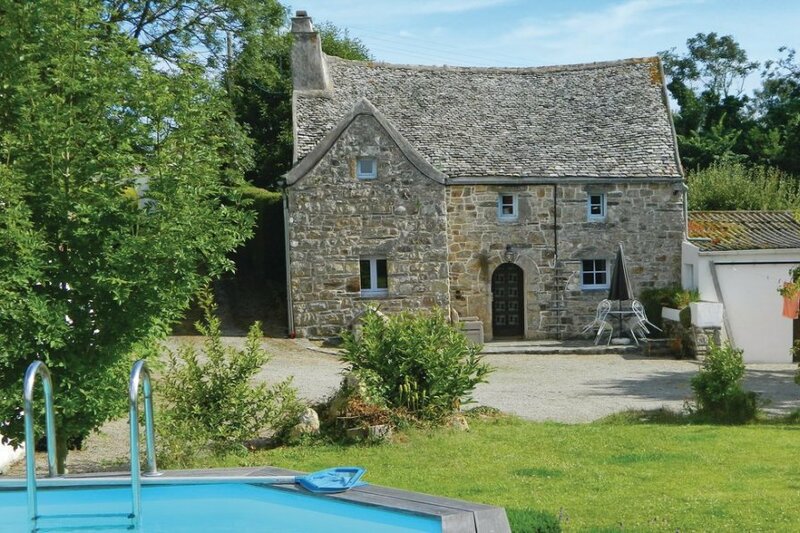 With nine stunning beaches only a few minutes away (only 1200m from the nearest cove), this traditional 16th century detached Breton cottage and splash pool, set in extensive south facing, private. With nine stunning beaches only a few minutes away (only 1200m from the nearest cove), this traditional 16th century detached Breton cottage and splash pool, set in extensive south facing, private, secure grounds, has kept its original features and makes the perfect spot for a relaxing family seaside holiday in a quiet location. An above-ground splash pool (4m diameter, depth 1.2m, with removable external steps for security), completes this lovely property. Only 5 minutes drive away, the neighbouring chic resort and port of Locquirec with its many sheltered coves, restaurants, creperies and cafés overlooking the sandy beach, sea and weekly street market is well worth a trip. Kerilly is located only 45 minutes from the ferry terminal in historic and lively Roscoff and one hour's drive from Brest airport. This is a superb base for those seeking sandy coves, rock pooling, beachcombing, coastal walks, dining out and colourful markets. 18km away is the tourist town of Morlaix with its many narrow walkways lined with medieval houses and a wide variety of restaurants and shops. Visit also the unforgettable Pink Granite coast within 20 minutes' drive.Shop, café/bar, restaurant 3km, beach 1200m. This villa is made from brick or stone and was originally built in 1600 and refurbished in 2014. The agent has rated it as a two star property so it is a plainly furnished villa with limited facilities. It is ideal for a cheap holiday. This villa has a private pool and is located in Guimaëc, only 18km from Morlaix. The nearest airport is 80km away. It is set in a convenient location, 1.2km away from a sandy beach. There's also a restaurant 3km away. The villa has free wireless internet. You can also park on-site at no extra charge. The villa is adequately equipped: it has a microwave and washing machine. It also has a barbecue.